98 unit housing development in Mataró. 80 unit housing development in Cubelles. With Marc Mogas. 170 unit housing development in Les Guardioles, Molins de Rei. 128 unit housing development in Parc dels Pinetons, Ripollet. 162 housing development, Sant Andreu de la Barca, Barcelona. 57 unit housing development in Cervelló. With Esteve Puigdengolas. 80 unit housing and mix use development, Sant Just Desvern. 60 unit housing and mix use development in Pont de la Cadena, Molins de Rei. With Ton Salvadó. 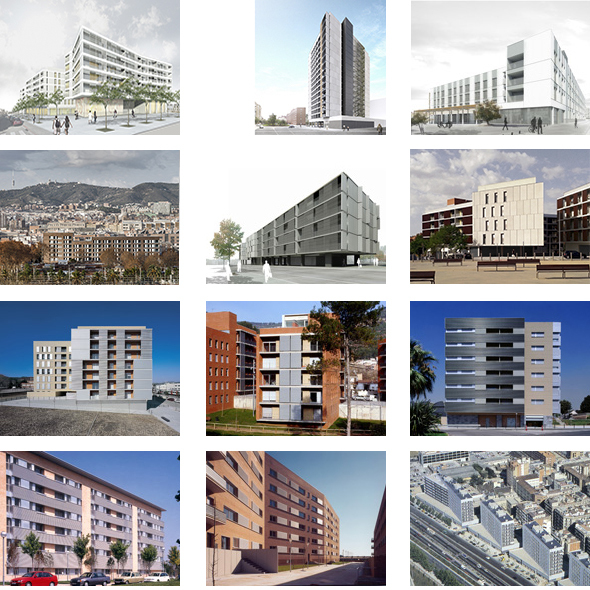 Competition for the master planning of 5 blocks in the Eixample, on the Poblenou waterfront. 342 unit housing development in Montigalà, Badalona. With Ramon Ausió. 200 unit housing and mix use development in la Barceloneta, Barcelona. Housing complex in Igualada, Barcelona. In cooperation with a group of students of ETSAB school of Architecture. New rural housing types in Tarragona design competition.